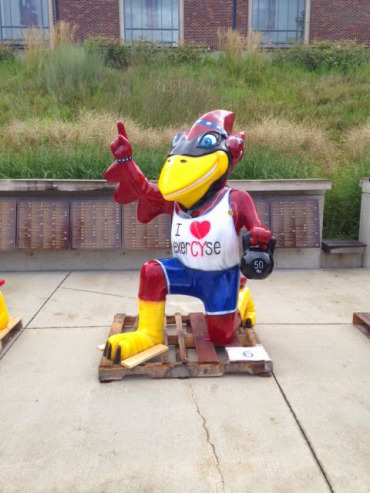 ExerCYse with Cy is an exciting way to experience the Cy statues around the city of Ames and get some exercise in while doing it! The ExerCYse with Cy contest challenges contestants to run, bike, walk or jog to 10 different Cy statues and snap an exercise-based selfie with Cy. To enter your selfies into the ExerCYse with Cy contest, tweet your pictures to us at @exerCyse or post them on Instagram. Also, like us on Facebook at ExerCYse is Medicine and upload your photos there. Once you submit 10 exercise-based photos with Cy, we will add your name to the growing list of those that met the Exercyse with Cy Challenge. Creative exercise-based selfies are encouraged! Start flexing with Cy and enter your photos. Click here to see who met the Challenge.